In the following text I am trying to explain how I understand the topic. After having studied different sources I have drawn up this post. The post topic is important for every blogger who wants to have a quality blog with quality content which attracts search engines and visitors. On the other hand, it is a great opportunity for writing a lively technical text for studying Tech English online. So, study the topic, study Tech English and write comments, which is the best way for practising the language. Find necessary terminology in the Internet English Vocabulary. Is a link analysis algorithm used by the Google Internet search engine. The algorithm assigns a numerical weighting to each element of hyperlinked documents on the World Wide Web with the purpose of “measuring” its relative importance within it. According to the Google theory if Page A links to Page B, then Page A is saying that Page B is an important page. If a page has more important links to it, then its links to other pages also become more important. PageRank was developed at the Stanford University by Larry Page (thus the term PageRank is after him) and Sergey Brin as part of a research project about a new kind of a search engine. Now the “PageRank” is a trademark of Google. The PageRank process has been patented and assigned to the Stanford University, not to Google. Google has exclusive license rights on this patent from the university. The university received 1.8 million shares of Google in exchange for use of the patent; the shares were sold in 2005 for $336 million. The first paper about the project, describing PageRank and the initial prototype of the Google search engine, was published in 1998: shortly after, Page and Brin founded the company Google Inc. Even if PageRank now is one of about 200 factors that determine the ranking of Google search results, it continues to provide the basis for all of Google web search tools. Since 1996 a small search engine called “RankDex” designed by Robin Li has already been exploring a similar strategy for site-scoring and page ranking. This technology was patented by 1999 and was used later by Li when he founded Baidu in China. 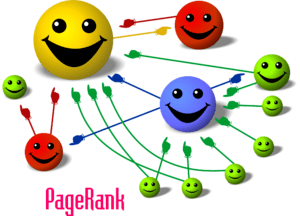 There is some basic information, which is needed to know for understanding PageRank. First, PageRank is a number that only evaluates the voting ability of all incoming (inbound) links to a page. Second, every unique page of a site that is indexed in Google has its own PageRank. Third, internal site links interact in passing PageRank to other pages of the site. Forth, the PageRank stands on its own. It is not tied in with the anchor text of links. b. Actual or real PageRank that is used by Google for calculation of ranking web pages. PageRank from the toolbar (sometimes called the Nominal Pagerank) has value from zero to ten. It is not very accurate information about site pages, but it is the only thing that gives you any idea about the value. It is updated approximately once every three months, more or less, while the real PageRank is calculated permanently as the Google bots crawl the web finding new web pages and new backlinks. Thus, in the following text the term actual PageRank is employed to deal with the actual PageRank value stored by Google, and the term Toolbar PageRank concerns the evaluation of the value that you see on the Google Toolbar. The Toolbar value is just a representation of the actual PageRank. While real PageRank is linear, Google uses a non-linear graph to show its representation. So on the toolbar, moving from a PageRank of 2 to a PageRank of 3 takes less of an increase than moving from a PageRank of 3 to a PageRank of 4. Lawrence Page and Sergey Brin have published two different versions of their PageRank algorithm in different papers. Where PR(A) is the PageRank of page A.
d is a damping factor, which is set between 0 and 1, nominally it is set to 0.85. PR(T1) is the PageRank of a site page pointing to page A. C(T1) is the number of outgoing links on page T1. Where N is the total number of all pages on the Web. The first model is based on a very simple intuitive concept. The PageRank is put down as a model of user behaviour, where a surfer clicks on links at random. The probability that the surfer visits a page is the page PageRank. The probability that the surfer clicks on one link at the page is given by the number of links at the page. The probability at each page that the surfer will get bored and will jump to another random page is the damping factor d.
The second notation considers PageRank of a page the actual probability for a surfer reaching that page after clicking on many links. The PageRanks then form a probability distribution over web pages, so the sum of all pages PageRanks will be one. As for calculating PageRank the calculations by means of its first model are easier to compute because the total number of web pages is disregarded. Admiring the dedication you put into your blog and interesting insight you offer here. It’s great to discover a blog in a rare occasion that is not all the same out of date rehashed material. Great job! I’ve saved your site and I’m adding your RSS feed to my Google account now. On top of that, I like your website so much that I would like to advertise my own site http://www.emt.co.il on it. I would appreciate you write me at: everythingrainbowhk (AT) gmail.com specifying your quarterly ad rates. Looking forward to your email! I have just sent e-mail to to you with my acception of your add. If you have scrapebox you probably spend hours in scrapping and building Blog list. You are so awesome! I do not suppose I’ve read anything like this before. So good to discover someone with a few original thoughts on this subject. Really.. many thanks for starting this up. This website is one thing that is needed on the web, someone with a bit of originality!